Longleaf Solutions engaged with Tallan to design a flexible data warehouse and dimensional data layer to support the BaselineEdge™ business intelligence product and help speed it to market. 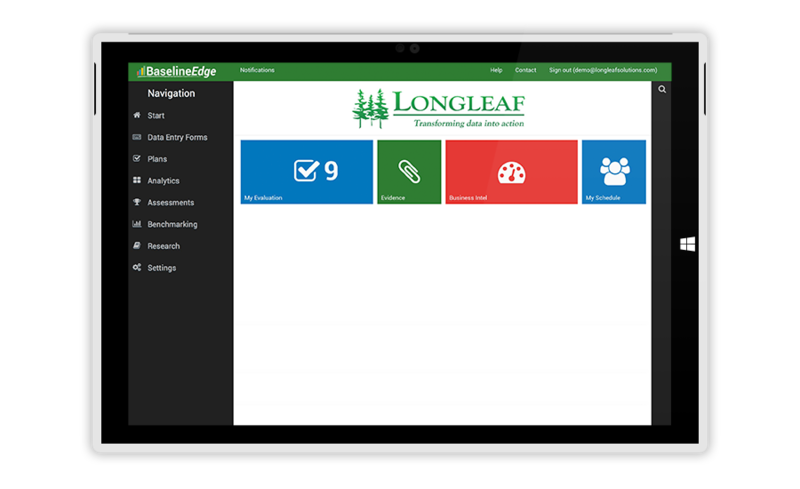 Longleaf Solutions – a startup software development company – needed a data store that could power their BaselineEdge business intelligence solution which tracks U.S. K-12 educational district student, operational and financial metrics. The development of this data model was critical for BaselineEdge’s time to market. Tallan’s approach to the Longleaf data warehouse design consisted of assessing various data feeds of student performance assessments and school operational and financial metrics from public and state sources, such as No Child Left Behind. Following the analysis, Tallan then embarked on a data consolidation effort, to form the foundation of holistic model entities, a key input to the data warehouse design. With a logical model envisioned, Tallan designed a robust and flexible operational data store incorporating integrity, attribute, and hierarchical best practices to formulate the Longleaf K-12 performance management data warehouse. To support a Windows Azure SQL Database data layer for the BaselineEdge business intelligence product, Tallan designed a custom dimensional database supporting measures, measure groups, and dimensions for optimized query retrieval. Tallan took into consideration existing functions and features in Silverlight and cloud-based Azure environments to formulate a lasting solution for the customer. The product is now successfully in the market and thriving. Click here for more exciting studies!